This recipe for blueberry chicken salad from Allrecipes.com was fast, easy and really good. 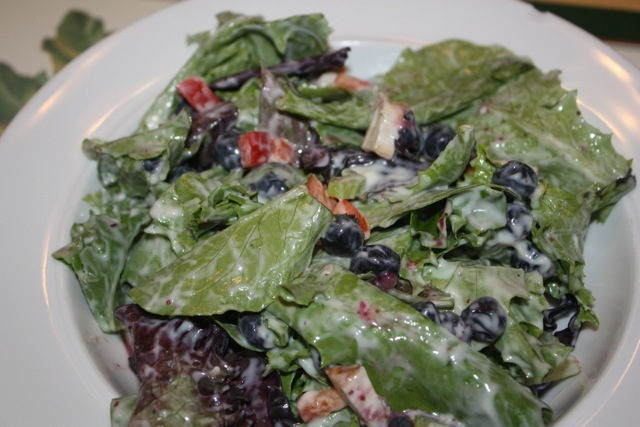 The dressing is lemon yogurt (6oz) and mayonnaise (3 Tbs), which sounded odd, but is really good, especially with the sweetness of the blueberries. Throw in some diced cooked chicken breast (we grilled a bunch earlier in the week and used it in several recipes), red pepper, celery and the blueberries. This was one of the only times the kids eat up a salad, including the lettuce!